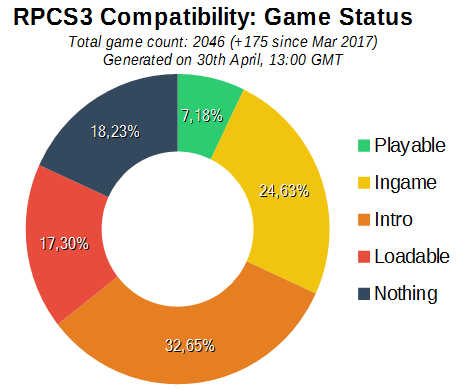 April was a very eventful month for RPCS3. The goal of this progress report is to highlight some of the more notable or interesting developments of the project. The report will start by showcasing a selection of games that were improved in one way or another. Thereafter we will summarize what work each contributor did this month. Since the last progress report, approximately 18 authors have made 104 commits, added 9,621 new lines of code and deleted 1,904 lines of code. This is the last real PlayStation 3 game and it also happens to be highly popular. Let us take a look at a few things. People often ask what kind of CPU is needed to run this game. The answer is that no CPU is truly fast enough right now, but if you enjoy playing games at 10 FPS or so, then feel free to get a CPU with a lot physical cores. See the screenshot below for the motivation behind this statement. Of course in the future when RPCS3 performance is improved such an extreme CPU likely will not be required. If you didn’t see it already, we made a video of [redacted] running in RPCS3 for our YouTube channel. Here are some really interesting results. [redacted] proved that this game is locked to 30 FPS on PlayStation 4 as well as 30 FPS on PlayStation 3. However, in RPCS3 it is possible to unlock the framerate meaning that It is theoretically possible to run this game at more than 30 FPS. Look at the screenshot below, the game is really running at 40 FPS here with no problems. After all, if it can run fine at 15 FPS, half its intended frame rate, why would it not run fine at 60 FPS, double its intended frame rate? Maybe there are some bugs, but maybe these could be patched just like Nekotekina patched an engine bug in Disgaea. Digital Foundry also pointed out the only other difference between the PlayStation 3 and the PlayStation 4 version of the game is the rendering resolution. But it is theoretically possible to increase internal rendering resolution in this game (although nothing has been implemented in RPCS3 yet). The point is, in the future the RPCS3 version of [redacted] could be the best version. [redacted] running at 4K and 60 FPS is very possible.